Liberty University Intramural Sports (LUIMS) is always looking for quality and dependable individuals who have a passion for sports and want to assist us in providing quality recreation opportunities for Liberty students, faculty, and staff. These workers also work and supervise other sports which include beach volleyball, dodgeball, kickball, and ultimate frisbee. This is a great opportunity to meet new people and for those looking at a career in sports. Working with LU IMS also allows you to improve your knowledge of sports! Training is provided so previous experience is not necessary but always welcomed! Intramural Sport Supervisors are responsible for the daily operation of each sport IMS has to offer. Knowledge of the sport they are supervising and knowledge of all Intramural Sports policies and procedures is a prerequisite. Duties include daily set-up and tear down of fields, supervision of officials/scorekeepers, supervising each game or match, and promoting their sport to the student body. Previous refereeing experience is preferred as well. This position is a great way for those who are going into some type of sports field to receive valuable experience in a supervisory role. This position requires 30-35 hours per week. 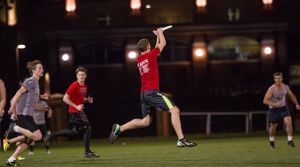 Intramural Sport Officials are responsible for enforcing sport specific rules for all participants and spectators. Officials are responsible for maintaining order and ensuring a safe and enjoyable experience for all participants. Knowledge of the sport they are officiating is a must. Training for each sport is provided at the start of each semester. Officiating Intramural Sports is a great opportunity for students to meet others and to create friendships that could last a lifetime. This position usually receives 12-18 hours per week. Intramural Sports Scorekeepers are responsible for most off the field activities. These duties include keeping score for games and signing in players for each sport. This position is also a great way to meet others and increase your knowledge of sports. This position usually receives 12-18 hours per week.